During the latest years, several Asian countries have become a top priority for investors and business people, as the involvement of high-tech innovation has made Asia one of the highly demanded tech hubs across the globe. In fact, several investors and entrepreneurs are now travelling to countries like Japan or China to avail excellent funding opportunities and to first-hand experience the groundbreaking innovations, in order to push digital transformation forward in their own respective companies. Worldwide businesses feel the urge to integrate new frameworks and new technologies, like high-tech hardwares and softwares, applications of artificial intelligence, machine learning and robotics, into their business structures in order to improve their products and services. The Asian countries have now become the home of the most talented and qualified techies and pioneers, and the Asian ecosystems provide the entrepreneurs with an excellent platform to showcase their talents and to acquire fundings for converting ideas into reality. The city-state of Singapore has acquired recognition for becoming one of the top-notch technology hubs in Central Asia, and it has certainly become the top destination for sprouting entrepreneurs to find their place in the emerging markets across the globe. It has been reported by the Singapore Economic Development Board (EDB) that nearly 80 out of 100 world-class tech firms have established their operations in Singapore. Also, according to the 2017 Bloomberg Innovation Index, Singapore ranks at number 6—right ahead of countries like China, United States, and Japan. Moreover, according to Jones Lang LaSalle’s study, Singapore has become one of the foremost foreign investment destinations for the tech giant companies such as, Tencent, Ali Baba, Google & Facebook. The city-state is widely acclaimed for its complex value chain, which is further strengthened by rules and regulations. Policymakers have earned the trust of multinational businesses, governments, and NGOs. That is an additional advantage for the companies that are considering to migrate their regional operations to the Singaporean land. Moreover, Singapore is not subjected to the China Cyber Security Act (which requires the international businesses to store their data on local servers). That has encouraged the Chinese entrepreneurs and business people to move their business operations to Singapore to avoid ceding personal data. Singapore is also a pioneer for initiating the inauguration of ASEAN, and it has set standards within the scope of data management, e-commerce, IP protection, digital money, and much more. In addition, the entrepreneurs traveling to Singapore can choose their residence near their offices or preferred tech spots, and they can avail several other perks and incentives when staying in Singapore. China is a massive and constantly growing tech market, and it is experiencing a proliferation of tech hub spots across its major megacities. Shanghai and Beijing are top tech hubs for entrepreneurship, Shenzhen has become the Silicon Valley of the Chinese nation, and Hangzhou is exponentially expanding being the Alibaba’s hometown. Huawei is the world’s largest telecom equipment provider and the world’s third largest smartphone producer behind Apple and Samsung. Tencent – China’s largest social media and gaming platform – became the most valuable company in Asia last year and is now among the world’s top 10 companies in market capitalization. According to the World Intellectual Property Organization, in 2017, China filed around 49,000 applications for international patents, nearly half of which came from Shenzhen, surpassing Germany in patent applications – and ranking fourth in the world. Additionally, it has been reported by Crunchbase that the inauguration of Chinese hubs has resulted in the escalation of 47% of the VC dollar volume in the second quarter (Q2) of 2018, which is quite impressive in comparison to the 35% percent share jointly by the companies based in Canada and United States (US) overall! China’s central planners have been attempting to literally “spread the wealth” with incentives to attract talent and investment. This has led to a blossoming of second-tier tech hubs, such as Chengdu, Nanjing, and Xiamen, that tend to be more specialized in nature than Beijing and Shenzhen, and which are developing unique tech entrepreneurship cultures all their own. Last but not the least, Japan is acknowledged for being one of the most innovative countries in Asia and worldwide. It is, in fact, regarded as the frontier of highly specialised and niche technologies and tech expertise. Even if in comparison to American tech hubs the Japanese tech ecosystem is relatively nascent, the quality and the depth of expertise and talents present in Japan is really unique and extremely valuable, especially in technologies such as robotics, artificial intelligence biotech, gaming, media, logistics and fintech. It is known that Japan has accumulated more than 127 billion Japanese Yen in venture capital in 2017, which is estimated to increase in the upcoming years. That statistic shows the fertility and the abundance of the business ecosystem in Japan. As of 2018, Japan has produced two unicorns and the government is aiming to raise this number to 20 by 2023. 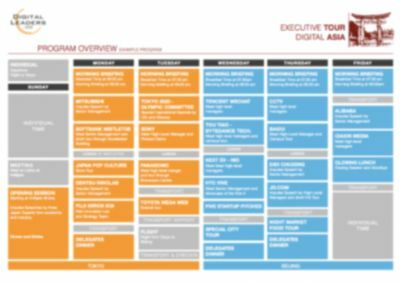 A Digital Asia Tour for C-level managers can be organized from one day to up to two weeks. The most common format is 4-5 days (Sunday till Friday) filled with 40+ agenda points plus one additional workshop day for the group on Saturday. The tour can be organised in different asian countries: China (Beijing, Shanghai, Shenzhen, Hangzhou and Hong Kong), South Korea (Seoul), Japan (Tokyo, Kyoto). We not only set up the curated agenda, but also we take care about all logistics such as airport pickups, hotel and accommodation, transport, lunches, private dinners and security pre-check in at the Company visits. The group will be guided by one or two members of our Senior Team.